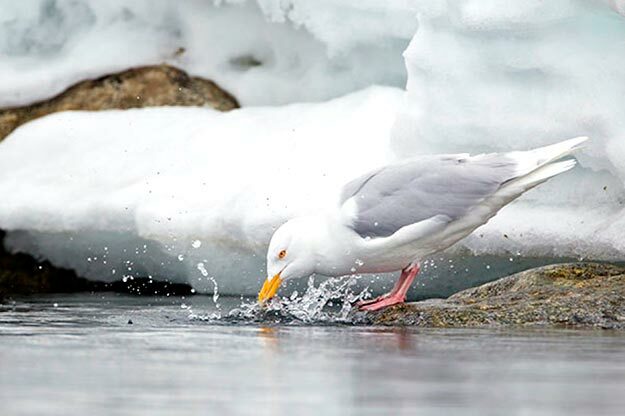 Clean Water Space » How do seagulls drink saltwater? For anyone currently whiling away their time at a beach (with a laptop and Internet connection, I guess), this question might occur to you. How do gulls, those birds so adept at stealing your sandwich or even invading your hotel room through an open balcony, drink saltwater? Gulls, and many other charadriiform birds, have supraorbital glands (also called nasal or salt glands) that help regulate the ionic balance of their blood, according to Britannica Online. While some salt is processed by the kidneys, the excess runs through the glands, which are positioned in grooves of the skull, and trickles out through the nostrils. Other animals also have salt glands, including sea turtles, crocodiles (crocodile tears) and sharks. Interestingly however, saltwater isn’t the gulls’ drink of choice. If they have the opportunity, or if they’re trying to conserve energy, they’ll stick to easier-to-process freshwater. It got me thinking about our own versions of salt glands — no, certainly not our kidneys, they’re lightweights when it comes to salt. I’m thinking of desalination plants, energy-intensive operations that turn saltwater into fresh. A while back, Scientific American published a special edition on energy vs. water — two of our biggest resource problems. One hazy topic in the article was desalination plants. They transform what seems like an endless but undrinkable resource into something potable, but they sure use a lot of energy in the process. It doesn’t help that our basic water demands are compounded by the two biggest freshwater consumers: agriculture and power plants (water cools coal, oil, natural gas and uranium plants alike). With such environmental baggage, it’s no wonder you’ll see plans for desalination plants appear and disappear as citizens protest, local leadership changes or summer gets awfully dry. Thirsty? How ’bout a cool, refreshing cup of seawater?